Reading good crime fiction is like listening to good music. Some novels are like putting on an album. Others are the whole concert going experience for the true fan, which includes anticipation. Once there, you get: the musicians on stage; the loud speakers; the big screen; the characters in the crowd; the lyrics and the music. The songs include old favorites and new tunes that take time to appreciate. Reading, The Marriage Tree, (Heaven Lake Press 2014) a Vincent Calvino crime novel by Christopher G. Moore, #14 in the series, falls into the concert going category. The Marriage Tree comes one year after the 13th in the series, Missing in Rangoon, which left Moore, if not Calvino, at the top of his game. I was pleased to learn The Marriage Tree begins with longtime fictional Bangkok private detective, Vincent Calvino haunted by a series of deaths that took place in Rangoon and Bangkok. Vincent is hurting as we have never seen him before. This is not the Calvino in SPIRIT HOUSE when he was left bleeding by a knife wielding katoey and a gun toting, lottery ticket seller. Nor the one in COLD HIT when Vincent got cold-cocked and wound up with a broken nose while delivering a birthday card. Or the many other times the pro problem solver has been shot at, punched at or threatened. This time the tough guys beating up on Vinny are the very ones his longtime friend, Royal Thai Police Colonel Pratt routinely diverted him from. Pratt is still Calvino’s friend but no longer his protector. And Calvino is beating himself up too. Just two reasons you know straight away, The Marriage Tree is different from any previous Calvino novel. Despite his difficulties, Calvino stumbles upon a new murder to solve with ties to dangerous old foes. They lead to an underworld network of human slavery, corruption and abuse. The scene about the destruction of a Rohingya refugee camp near the Myanmar border is vivid in its description and inhumanity. Moore is a risk taker. It is one of many qualities I like about his writing. Christopher G. Moore has his critics. The more adamant ones might cite the Rohingya history lessons in the middle of the novel as unnecessarily long and not essential to a fictional crime story. I disagree. The benefits of reading Moore’s writing are varied and diverse. He gives the reader a murder mystery that is top notch. But Moore also provides a good story within a good story. And that story is on the front pages of the newspapers at times, even if some important people would like it buried forever, like so many bodies at sea. That’s harder to do than it sounds. Moore moves those dual stories forward with colorful settings, characters you care about and plot points difficult to guess correctly. Woven into the mix are Moore’s observations about humanity, power, corruption, illusions, culture, technology, wealth, the spirit world, rituals, privacy, individuality, relationships and the upside of being a farang in Thailand as well as the downside of being a Rohingya refugee caught in no man’s land. It’s all there, streaming on demand in The Marriage Tree. One of the more interesting characters is Calvino’s love interest, a brilliant mathematician who made a fortune in the algorithm information gathering age, Dr. Marley Solberg. She helps Calvino in more ways than one all the way up to the believable, well written and satisfying ending. 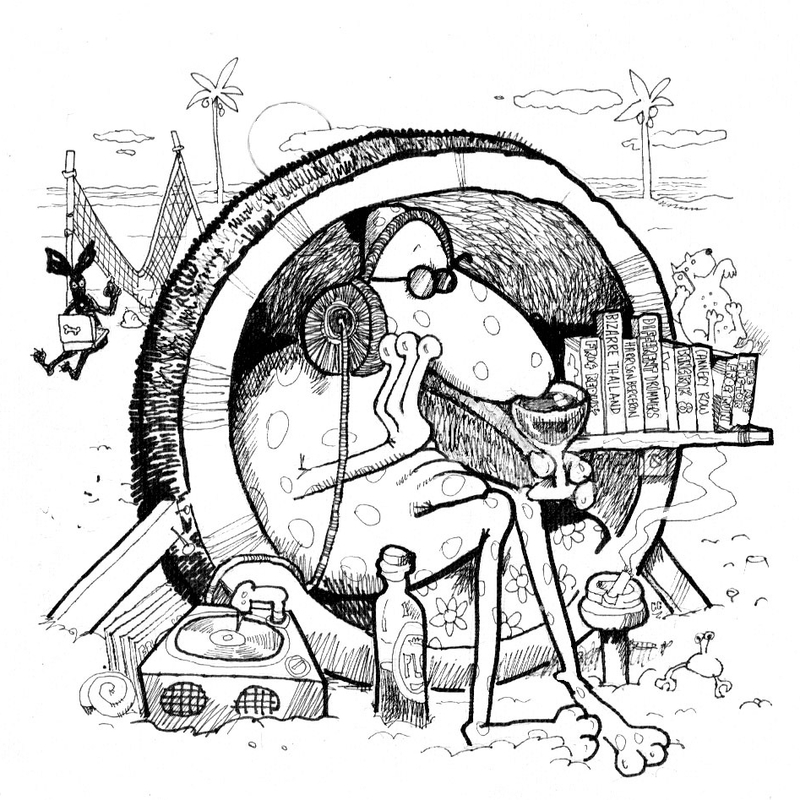 Longtime readers of the series will also enjoy the return to prominence of Calvino’s crude talking, hard drinking and chain smoking buddy, McPhail. The Marriage Tree stands up perfectly well as a stand-alone murder/mystery, mystical/thriller, but those who read Missing in Rangoon first will benefit. The Marriage Tree is a top tier crime novel set in a top tier city, Bangkok, to be enjoyed by crime fiction readers everywhere. Christopher G. Moore is an accomplished novelist. If you like staying at home in your cozy chair, listening to your music on low, he may not be the read for you. If you don’t mind a live venue with the sound a bit loud, compound but satisfying with a slight risk you may get a drink spilled on you, then he may well join your list of favorite crime novelists for good, if he is not already among them. 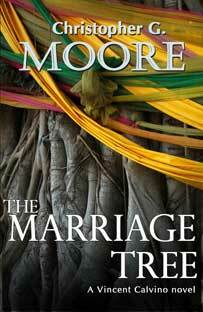 Mr. Moore is appearing in Chiang Mai on Saturday, December 28th, 2013 at Suriwong Book Center on Sridonchai Road, where he will be available to sign copies of The Marriage Tree from 2:00 p.m. to 4:00 p.m. Phone: 053 281 052 for more details. Paperbacks of The Marriage Tree are available now throughout Thailand. Ebooks will be available in January 2014.